.Chapions Meet Hostile Crowd in Alabama City. Near-Riot Starts in the 9th When Marberry Hits Batter. MOBILE, Ala:, April- 4.--Several years ago the Mobile club decided to change its nickname from "Gulls" to "Bears.� After witnessing, this afternoon's battle, which ended in a 13-inning 7 to 7 draw, "Tigers" would have been much more appropriate, for Kid Elberfeld has one fighting team. For the first few innings play was rather listless and, the fans, just to keep time from hanging heavy on their hands, started "ridding" the umpires. Soon the Mobile. players thought they really were playing against 11 men and and every decision they made brought forth protests' from the players and derision from the stands. It looked as though the sparks would burst into flame in the ninth. With the knot tied at 6 all, two dead and Devormer on first as a result of McNally dropping his easy pop-fly, which would have been the final out of the frame, "Cowboy" Jones poled one over the right-field fence which was foul by a narrow margin. After this argument was settled in Umpire Rowland's favor, Marberry, who was toiling, hit Jones with a wild one. This was a signal for Elberfeld to rush out and call "Firpo" several names not found in The Post's dictionary. Fred started for the Mobile manager, but Harris and Judge calmed him down. Meanwhile, Elberfeld kept hurling insults from the bench at Marberry, and when the frame ended, Fred again started for the "Kid," several police and players rushing out and keeping the two apart. Jones following the example of his boss, decided to argue some more about Rowland's decision on his drive over the fence and was banished. When the Bears lined up, Rowland noticed "Cowboy" still in the left garden and called upon Elberfeld to remove him. This was done after some argument, the player starting for the "ump" on his way in, but was steered toward the bench by Pitcher Blethen. From then on the two teams appeared about as friendly as a couple of strange bull dogs. THE game itself, it was hard fought all the way. The Nats hit much better, but the Bears had their batting eyes with them too. The Nats took the lead in the first on McNeely's double, Harris's suicide and Rice's one baser and then saw the home team pass them in their half as a result of three hits, one a double, Harris' error and a scrifice. In the fifth Judge opened with a home run over right field wall. Two other markers were coined, both being in by Wiltse, who walked four this session. In the alien sixth, Milvey's double, and a single by Cueto gave the Mobile entry one run and when they manufactured another in the eighth, wrapping two infield outs and Donohue's one base around one of Marberry's passes, the score was tied. With Leibold, who hit for marberry, out of the way in the tenth, the world's champs scored a run on successive doubles by McNeely and Harris, but once more the Bears were able to equal their efforts, Pat Kelley's single, Blethen's sacrifice and Donohue's double doing the trick. 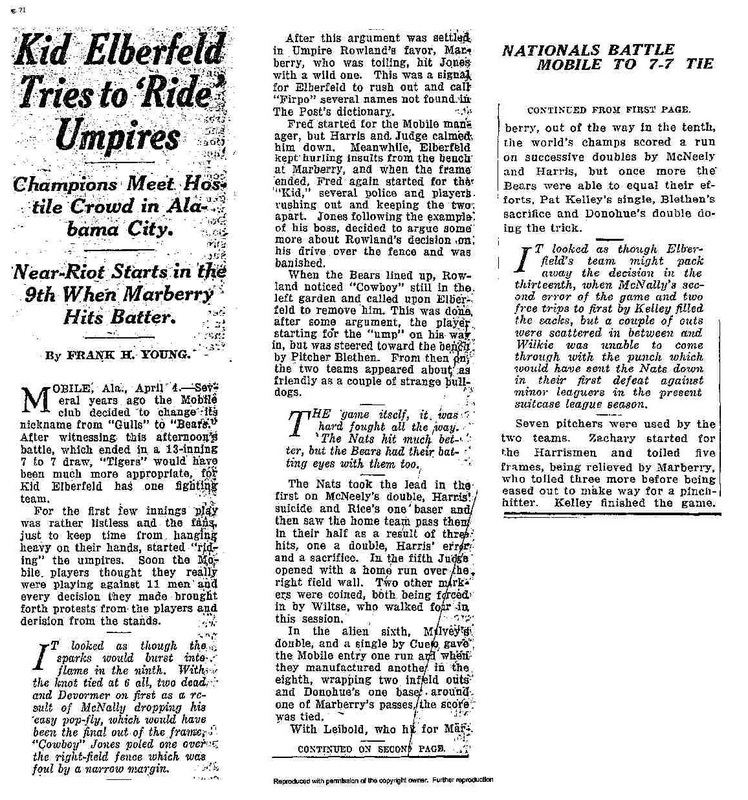 IT looked as though Elberfield's team might pack away the decision in the thirteenth, when McNally's second error of the game and two free trips to first by Kelley filled the sacks, but a couple of outs were scattered in between and Wilkie was unable to come through with the punch which would have sent the Nats down in their first defeat against minor leaguers in the present suitcase league season. Seven pitchers were used by the two teams. Zachary started for the Harrismen and toiled five frames, being relieved by Marberry, who toiled three more before being eased out to make way for a pinch- hitter. Kelley finished the game.